In line with our philosophy of helping our patients look after the teeth nature gave them, we offer a safe and gentle method of significantly whitening your teeth without resorting to expensive and invasive procedures. In order to whiten your natural teeth by up to 16 shades, we use a process called Evolution bleaching. 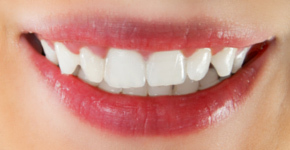 Teeth are gently whitened by increasing their permeability to oxygen which breaks down stain molecules. The procedure is completely safe; “bleaching” may sound a bit scary but it has been used in dentistry for over 100 years. Why choose Enlighten teeth whitening ? Enlighten is a well respected system of tooth whitening using a combination of carbamide and hydrogen peroxide, which is the only legally licenced product for tooth whitening in the UK and Europe. The temporary sensitivity which can be experienced with tooth whitening treatment is minimal with Enlighten. Each course of treatment is tracked by the manufacturers to ensure optimal safety of the product. What are the options to have my teeth whitened ? The NHS advises patients to only go to a registered dental professional for teeth whitening because whitening by people who are not dentally qualified, for example in beauty salons, is illegal. Home kits also carry risks. We take an impression of your teeth to produce a mouthguard custom made to your mouth to ensure the safety of the treatment. We then provide you with instruction to apply a bleaching gel over a period of 2 weeks. How white will my teeth get ? Evolution bleaching can whiten teeth by up to 16 shades. Results vary but if used correctly all teeth will whiten dramatically. Will my teeth look too white ? No, natural teeth rarely look too white, contrary to artificial crowns or veneers which can sometimes look “wrong” because they are made of porcelain. Will my crowns, veneers or fillings change colour ? No. As they are artificial, crowns, veneers and fillings will not change colour. This is something we discuss with you prior to starting any treatment so you can decide if the treatment is right for you or whether you would like to consider changing some of them after bleaching. Is teeth whitening uncomfortable ? You may get some temporary sensitivity. However, we give you some easy to use desensitising swabs to take home which help to reduce this. Results can last indefinitely with some very simple maintenance: wearing your trays for 1 night every couple of months to maintain the whiteness levels achieved by the treatment. Completely. The materials used in Evolution bleaching have been used in dentistry for over 100 years. We work exclusively with Enlighten research laboratories products to provide high quality and safe teeth whitening for our patients in Leighton Buzzard and Milton Keynes.